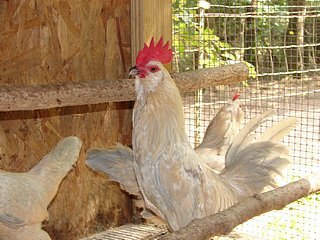 The Bearded d'Uccle is only available as a bantam chicken and is a good layer of small eggs. Size: Male: 26 oz. / Female: 22 oz. Comb, Wattles & Earlobes: These birds have a bright red single comb that has five well-defined points and stands upright. They have bright red wattles and earlobes that are medium sized in males and small in females. Color: Unless otherwise noted the beak is in shades of horn and the eyes are reddish bay. The shanks and toes are in shades of slate. Black: The eyes are black. They have standard black plumage. Blue: The eyes are dark brown. They have standard blue plumage. Buff: The shanks and toes are slaty white. The standard buff plumage. Golden Neck: The beak is light horn with a reddish tinge. The plumage is primarily golden bay tipped with a creamy white spangle. The wings are golden bay highlighted in creamy white. The main tail feathers are creamy white and coverts are the same color as the back. The under color is creamy white. Male: The back is rich, lustrous red. Gray: They have standard gray plumage. Mille Fleur: They have standard mille fleur plumage. Mottled: The eyes are dark brown. They have standard mottled plumage. Porcelain: The shanks and toes are pinkish slate in females. They have standard porcelain plumage. Self Blue: The eyes are dark brown. They have standard self blue plumage. White: The shanks and toes are white tinged with slate. They have standard white plumage. Special Qualities: A nice disposition for showy backyard and barnyard flocks. They are good layers for bantams. The Bearded d'Uccle was developed by Michel van Gelder in Belgium around the turn of the century. He crossed Bearded d'Anvers with feather-legged bantams attempting to get a booted bird with low posture, a compact body, a full beard, and a single comb. The Bearded d'Uccle is a close relative to the Booted Bantam, which is the same bird basically without the beard. They are both true bantams with no standard counterpart. Both sometimes go by the nickname "Millie" as they were both imported in the mille fleur color, although a number of colors now exist for each bird. These birds are known to have a good disposition being friendly and calm. They are good foragers and flyers and do well in free range situations. If you live in a subdivision you may have to be careful though, as they are such good fliers that they can get over all but very tall fences. This breed was first admitted into the APA in 1914.